AUGUSTA, GA. – Dr. Graeme Connolly had his presentation, “The Coaching Approach of a Successful High School Softball Coach,” accepted for the 2015 Society of Health and Physical Educators (SHAPE) America Southern District Convention to be held Feb. 18-21 in Atlanta. The presentation is part of a larger research study called The Coaching Approaches of Successful High School Team Sport Coaches. Dr. Paulette Harris and Dr. Nai-Cheng Kuo will host National Family Literacy Day at GRU Oct. 31 and Nov. 1. Dr. Paulette Harris presented “Librarians and Teachers in Tandem: Preventing Plagiarism in our Digital Age” at the Georgia International Informational Literacy Conference in Savannah, Ga., on Oct. 10. Dr. Andrew Kemp was named the assistant program chair for the 2015 American Association for Teaching and Curriculum Conference to be held in Portland, Maine. Dr. Andrew Kemp was named the program chair for the 2016 American Association for Teaching and Curriculum Annual Conference to be held in Grand Rapids, Mich.
Dr. Andrew Kemp presented “Teacher Educators Share the Beginnings of their Journeys Expressing their Voices, Minds, and Stories” at the Southeast Regional Association of Teacher Educators Conference Oct. 16-18 in Charleston, S.C. He presented with University of Central Arkansas Professor Nancy Gallavan, past president of the Association of Teacher Educators and the Pacific Association for Teacher Education Professor; and with Dr. Lisa Buchanon, Professor of Education from University of North Carolina-Wilmington. Dr. Darla Linville presented “What Does Policy Have to Do with It? Anti-bullying Legislation and LGBTQQ Youth in Schools” as the Visiting Guest Scholar at Montclair State University, in Montclair, N.J., on Nov. 13. Dr. Molly Quinn presented a working paper, “Rogue Enlightenment and Education’s Future of the Past: Transatlantic Teachings from Colonial Louisiana,” with co-author Petra Hendry, Professor of Education at Louisiana State University, at the Journal of Curriculum Theorizing Conference on Curriculum and Classroom Practice in Dayton, Ohio, on Oct. 9-11. Dr. Molly Quinn participated as plenary speaker at the International Institute for Critical Pedagogy and Transformative Leadership in Chihuahua, Mexico. She featured her new book, Peace & Pedagogy, and spent time in an area elementary school working and learning with teachers and students. Dr. Molly Quinn had her article, “Just Dance: Hope and Happenstance in Reading Curriculum, Aesthetics & Ethics with Donald Blumenfeld-Jones,” accepted for publication in the national peer-reviewed Journal of Curriculum Theorizing. Dr. Laura Russ had her abstract, “Systematic Review and Meta-Analysis of School-based Multi-component Physical Activity Interventions” accepted as an oral presentation for the Research Program of the 2015 SHAPE America National Convention and Exposition in Seattle, Wash. Russ is first author on the abstract. Dr. Lenares-Solomon and graduate assistants Tanya Lorenzi (M.Ed. in Counselor Education) and Erika Klipa (M.Ed. in Counselor Education) will present “School Counselors as Advocates against the Commercial Sexual Exploitation of Children” at the Georgia School Counselors Association Annual Conference on Nov. 10 in Augusta, Ga.
Dr. Juan Walker presented the first of his Teaching with Primary Sources workshops on Oct. 11 at Georgia Regents University. Dr. Judi Wilson presented “Data Driven Decisions: Interstate Conversations and Collaborations for Successful edTPA Implementation” at the National edTPA Conference in Los Angeles, Calif., on Oct 25. She presented with colleagues from Austin Peay State, Illinois State, Shorter College and Columbus State University. Dr. Judi Wilson presented “Nurturing Collaborative Studies on Teacher Education: Germinating State-Wide Initiatives and Planting the Seeds for a Research Consortium” at the 2014 Annual Georgia Association of Teacher Educators (GATE) Conference in Brasstown Bald, Ga., on Oct. 30. She presented with colleagues from Columbus State University and Georgia State University. Dr. Misato Yamaguchi presented “Discovering the Silenced Voices: Teaching about Japanese Internment Camps through personal Narratives” at the Georgia Council for Social Studies Annual Conference on Oct. 17 in Athens, Ga. 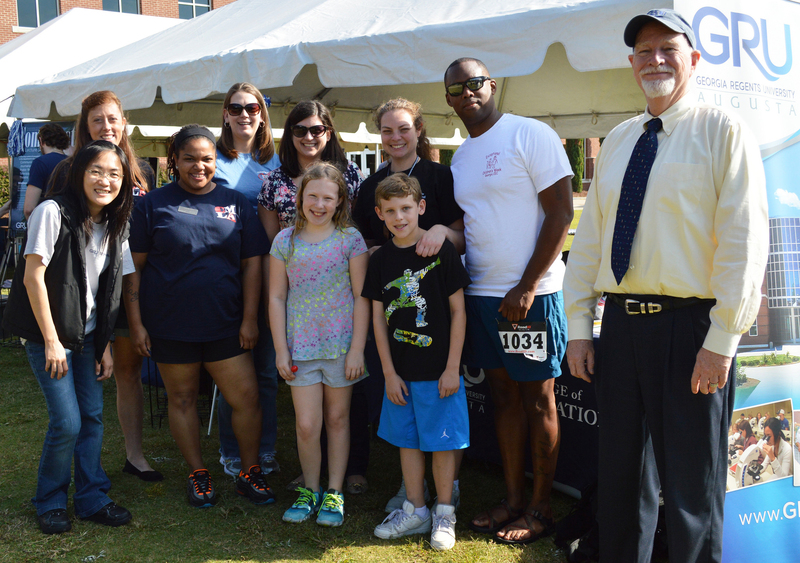 The College of Education and student organizations participated in Family Day on the Summerville campus on Oct. 11. Click here for an album of photos.